Online ordering menu for L&A Cafe. 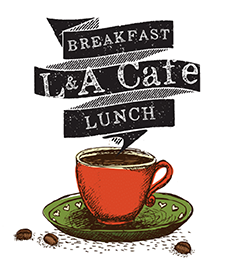 Welcome to L & A Cafe! We are a new breakfast and lunch cafe in the Poughkeepsie/Arlington area. We start early with many Breakfast options as Farmers Omelets, Full Stack Buttermilk Pancakes and more. We also have Mexican style Breakfast as Chilaquiles, Handmade Quesadillas and much more Mexican favorites. We have a robust lunch menu that includes Salads, Soups, Pasta Dishes, Mexican dishes, Hamburgers, Heroes,Wraps and more! We are located in the middle of the East-West Arterial by Hoffman Ave. We are just across the street from AutoZone and Red Cap Cleaners. Order online now for take out or delivery!